Ed Rasimus was born on September 29, 1942, in Chicago, Illinois. He was commissioned a 2d Lt through the Air Force ROTC Program at the Illinois Institute of Technology on June 4, 1964, and went on active duty beginning July 8, 1964. Lt Rasimus next completed Undergraduate Pilot Training and was awarded his pilot wings at Williams AFB, Texas, in July 1965, followed by F-105 Thunderchief Combat Crew Training at Nellis AFB, Nevada. He deployed to Korat Royal Thai AFB, Thailand, as an F-105D pilot with the 421st Tactical Fighter Squadron of the 388th Tactical Fighter Wing from May to November 1966, and then served as an instructor pilot with the 3525th Pilot Training Squadron and the 3526th Student Squadron at Williams AFB from December 1966 to May 1970. 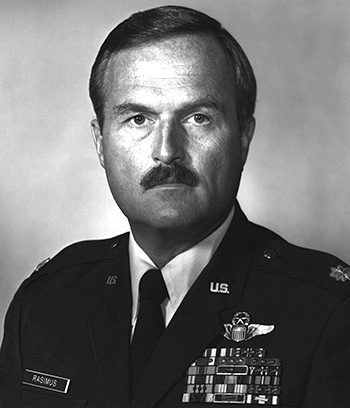 His next assignment was as a Personnel Staff Officer for Undergraduate Rated Officer Assignments with Headquarters Air Training Command at Randolph AFB, Texas, from May 1970 to April 1972. After completing F-4 Phantom II Combat Crew Training at Luke AFB, Arizona, Capt Rasimus served a second tour in Southeast Asia as an F-4E pilot with the 469th and then the 34th Tactical Fighter Squadrons at Korat Royal Thai AFB from July 1972 to July 1973. His next assignment was as an F-4C pilot with the 613th Tactical Fighter Squadron of the 401st Tactical Fighter Wing at Torrejon AB, Spain, from August 1973 to July 1977, followed by Air Command and Staff College at Maxwell AFB, Alabama, from July 1977 to July 1978. Maj Rasimus served on the staff of Headquarters U.S. Air Forces in Europe at Ramstein AB, West Germany, from July 1978 to July 1981, and then served as an AT-38B Talon Instructor for Lead-in Fighter Training with the 435th Tactical Fighter Training Squadron of the 479th Tactical Fighter Wing at Holloman AFB, New Mexico, from July 1981 to July 1985. His final assignment was as an Air Liaison Officer with the 2nd Brigade of the 4th Infantry Division (Mechanized) at Fort Carson, Colorado, from July 1985 until his retirement from the Air Force on July 1, 1987. Ed Rasimus died on January 30, 2013. First Lieutenant Edward J. Rasimus Jr, distinguished himself by gallantry in connection with military operations against an opposing armed force near Hanoi, North Vietnam on 26 September 1966. On that date, Lieutenant Rasimus, flying an F-105 Thunderchief, successfully attacked a heavily defended petroleum storage depot. Despite heavy anti-aircraft fire which downed another aircraft in the area, and continuous threat of Surface to Air Missile attack, Lieutenant Rasimus delivered his high explosive ordnance directly on the target. This attack effectively deprived the hostile forces of vast quantities of war material necessary for the continuation of the insurgent activity in the Republic of South Vietnam. 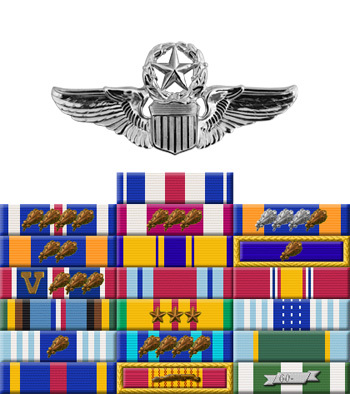 By his gallantry and devotion to duty, Lieutenant Rasimus has reflected great credit upon himself and the United States Air Force.